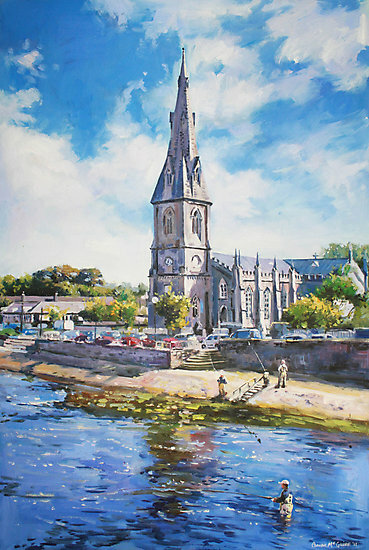 This old image shows the Cathedral of St Muiredach, Ballina, which is the episcopal see of the diocese of Killala. Muiredach was the abbot-priest whom Patrick left to be the leader of the Church of north Mayo. He may have been the founder of a monastery on the island of Inishmurray, seven kilometres off the coast of Mullaghmore, Co Sligo. Patrick Duffy tells what is known about him and his relationship with the diocese of Killala. Muiredach is venerated as the patron of the diocese of Killala. The tradition is that he was an “old man”, perhaps a presbyter or priest, in Saint Patrick’s household (late 5th century), whom the latter left to be abbot-priest or bishop in north Mayo and west Sligo. He may have been the founder of a monastery on the 228 acre island of Inishmurray ( = the Island of Muiredach?) 7 kms off the coast of Sligo, near Mullaghmore, though St Molaise is also mentioned in connection with the same island. Here the architectural remains include a wall, an oratory, beehive cells, altar stones and crosses. 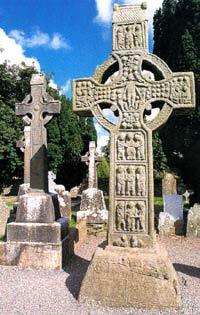 It is the most complete example of an early Irish monastery. The island remained inhabited up to 1948 and was a pilgrimage destination up to recent times. One of the greatest examples of Irish stonework is called the Cross of Muiredach, located at the former monastic centre of Monasterboice, Co Louth. It has an inscription which reads ÓR DO MUIREDACH LAS NDERNAD IN CHROS, which translates as “a prayer for Muiredach who had this cross made”. This is not our saint, but may have been a ninth century abbot of the monastery or a king whose territory included the site of the monastery. The diocese of Killala was created by the Synod of Rathbreasail in 1111 and the boundaries were revised and confirmed at the Synod of Kells in 1152. It was in the time of Bishop Bellew (1779-1812) that Ballina, Co Mayo, became the ecclesiastical centre of the diocese. 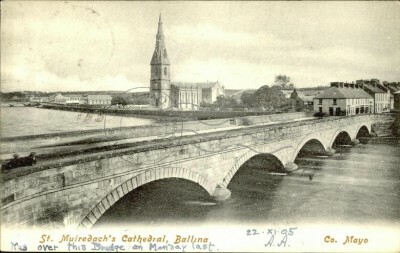 St. Muredach’s Cathedral was begun there in 1828 when John MacHale, later Archbishop of Tuam, became coadjutor bishop, and though externally complete in 1831 and had a spire added in 1852, the project was not complete until 1892. It was recently renovated at a cost of £1.5 million. Bishop John Fleming is the present bishop of the diocese. St Muiredach’ feast is on 12th August.